If you don't have the backyard space to make a Japanese rock garden where you can spend long afternoons meditatively raking ripple-like patterns into the sand below your feet, settle for the next best thing by making a simple, miniature zen garden that can easily fit on the corner of your desk or nightstand. 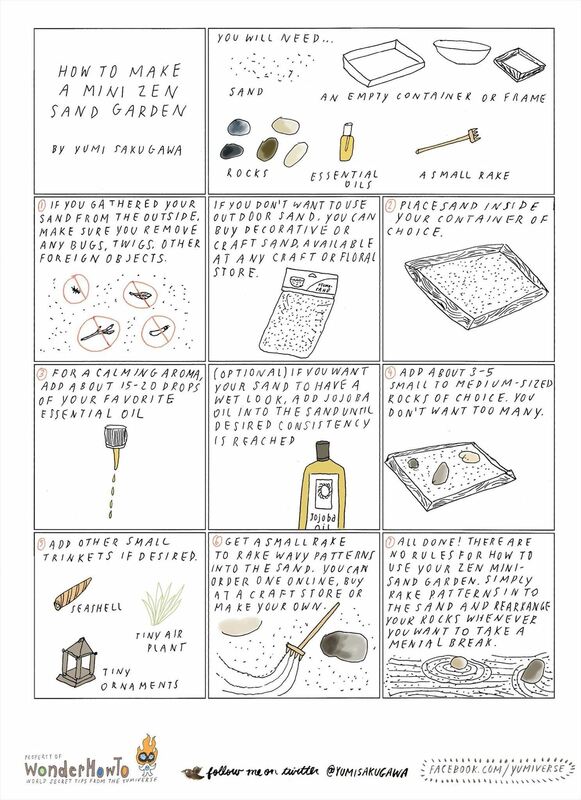 All you need are sand, an empty container or frame, about three to five rocks, essential oils, and a small rake. Simply fill the container with sand, add the rocks of your choice, and mix in some essential oils for a calming scent. Anytime you wish to give yourself a calming activity while you brainstorm or to simply relax, rake patterns into the sand, arrange the rocks into different formations, and feel some peace of mind.